The horse-racing footage is excellent and the music unusually upbeat in this episode about dirty doings at a racetrack. When racehorse Bright Magic loses a fixed race, jockey Tic Barton gets his walking papers. A little man with big problems, Tic confronts bigshot Johnny Starr and they fight over whether the horse was doped. Johnny knocks Tic down and throws him out�but not his gun. Two shots later, Starr is dead. The police have an eyewitness who saw Tic leave the apartment, and the little guy is arrested for murder. To complicate matters, Tic�s tall, shapely wife was having an affair with Starr. This sounds like a job only Perry can handle. Billy Pearson, a real-life jockey, quiz-show winner, and art connoisseur, made his acting debut in this episode. CARS: 1958 DeSoto Fireflite 4Dr station wagon, Shopper or Explorer, medium color. From The Cars by Greg Cockerill. Goof: In the horse race, Bright Magic is horse number 1. Tic Barton has the number 1 on his sleeve, and it is easy to see the number 1 on the horse. When the horses cross the finish line, the announcer says Bright Magic came in third. If you pay attention, the number 4 horse won the race, followed by horses numbered 10 - 8 - 7 - 9. Nowhere can you see horse number 1. Submitted by PaulDrake 33. When jockey Tic Barton (Billy Pearson) stops to see his horse the night before the big race, assistant trainer Eddie Davis (Joe diReda) tells him that his wife left a number where she can be reached if he has decided to throw the race. The number is WEbster 12499. According to the last episode (�TCOT Married Moonlighter�) calling this number should connect one with Walsh�s Appliance store (where Your Credit is Good!). I wonder if this number was some kind of in-joke on the Mason set at the time. Submitted by FredK, October 25, 2009. Sightings: Distinguished Gentleman #1 made it out to the races, along with �Miss Carmody� and Quiet Old Man #1. We can see all three of them in the stands behind the owner and trainer just before the race starts. The Quiet Old Man is not so quiet, however; he puts his face in the shot in front of Starr and cheers on his horse! (�Miss Carmody� shows up later in the courtroom as well.) Submitted by gracep, 1/6/2010. +At the race, seated behind Perry is the Distinguished Gentleman #1, and Little Old Lady #1. Little Old Lady #2 and Distinguished Lady #4 attend court on Perry's side. Submitted by BigBill767, 12/9/16. Uncredited Actors: Lee Miller attends the big race seated behind Perry. Don Anderson attends court on Burger's side. Submitted by BigBill767, 12/9/16. Continuity: After the shot of Quiet Old Man #1 clearly in front of Starr in the grandstand (see above), other shots show him clearly behind. And in the courtroom gallery, �Miss Carmody� (see above) moves around a bit, too. Submitted by gracep, 1/6/2010. Stock Music: The music heard after Eddie gives Tic the phone number to reach his wife and during his call to Starr and later as he approaches and enters Starr's apartment was composed by Jerry Goldsmith for an earlier CBS pilot. 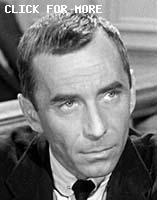 It was reused several times on Perry Mason and The Twilight Zone (in particular, the episode "The Fever") and has become so identified with the latter series that it was included on Varese Sarabande's Twilight Zone soundtrack. The 3:13 track entitled "Jazz Theme" can be found on the album (Volume Four, STV81192) and CD (''The Best of... Volume One, VCD47233). A slower version of the jazz theme (not heard on the soundtrack) can be heard in this episode after the judge adjourns for the day. Submitted by Wiseguy70005, 8/03/12. 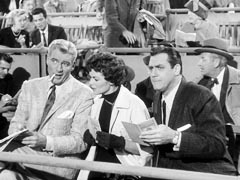 Syndicated cuts: The announcement that the horses are approaching the starting gate and Perry, Della and Paul watching; scene with Tragg investigating the murder with the coroner and witness Horty; Perry and Paul questioning Eddie about his injury and the doping of the horse; a horse trailer arriving at Bannion Stock Farms; In jail, Tic recounting to Mason the events at Starr's apartment and Perry asking who tipped off the police. Submitted by Wiseguy70005, 8/03/12. Joseph Forte makes his second Mason appearance here, and as he did in episode #4, TCOT Drowning Duck he plays the Coroner. Mr. Forte also appeared in Them (1954), another film heavily populated by future Mason actors. Naturally, he plays the county medical examiner who performs an autopsy on one of the victims of giant mutant ants. He gets the million dollar line: "And here's one for Sherlock Holmes. There was enough formic acid in him to kill twenty men." Submitted by FredK 12 December 2012. This is beautiful Barbara Lawrence's second appearance on Perry Mason so far. In both episodes she was married to a short man. Submitted by Duffy, 12 May 2014. That would be 'Half Wakened Wife'. It was almost a shame to set beautiful Barbara Lawrence in these roles - but she does a great job of convincing you to dislike her character! Submitted by MikeReese, 9/25/2016. Billy Pearson�s acting is painful to watch in this episode. I guess you could say that as an actor he was a wonderful jockey. Small wonder that he had only one other appearance, 14 years later on the screen. Submitted by PaulDrake 33, 7/17/2008. + That role was "Stationmaster" In "The Life And Times of Judge Roy Bean" [1972 IMDb]. Mike Bedard 6.1.16. When Della inadvertently provides the solution to the case, Perry says "Della! You're a doll! A stunned Della says "I didn't think you noticed." Submitted by DellaFan, 5-13-2014.